17. Carroll McLean Patterson . Son of James Wesley "Jim" Patterson & Sarah Ann "Annie" Brown. Born 25 Dec 1896 in Tweedside, NB. Died 22 Jan 1985 in Harvey Community Hospital. Buried in Harvey Settlement Cemetery. Occupation Farmer. 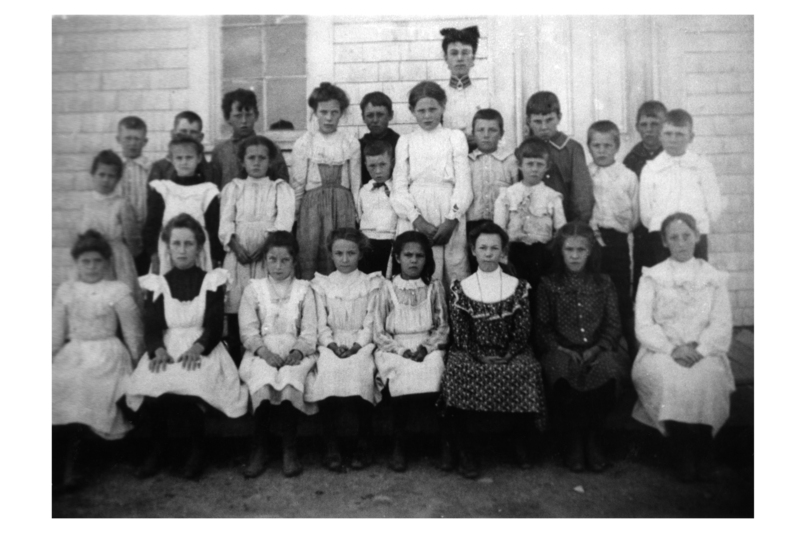 1904 school phototraph of Tweedside School. 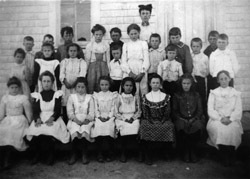 Eight year old Carrol Patterson is second from right in the back row with the dark shirt. Source: original image in Hazen Patterson collection: Rephotographed by Tim Patterson summer 1985 and copied image rescanned and digitally enhanced by Tim Patterson November 2006. 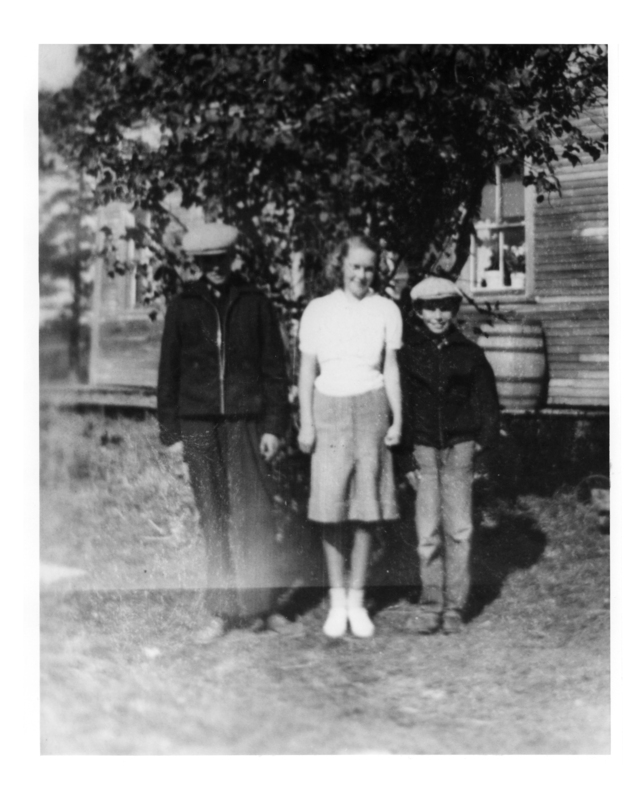 Caption was dictated to Jean Patterson by then 90 year old Hazen Patterson in 1985. Present location of original image is not known. Rephotographed by Tim Patterson, July, 2006. 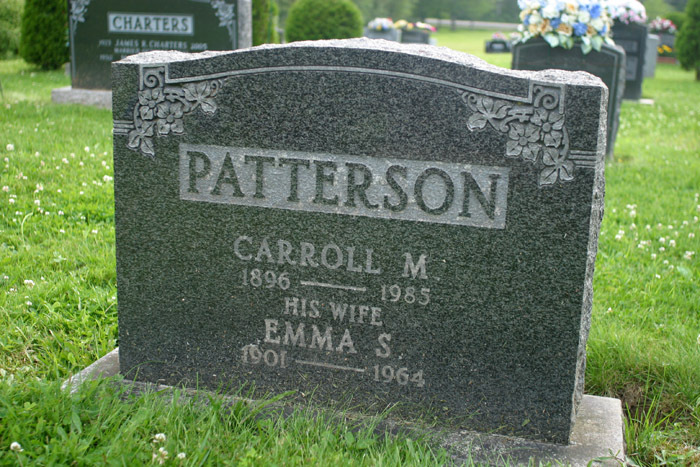 Carroll Patterson was a veteran of World War One, having served overseas as a private (Regimental Number 3260367) with the 13 th Canadian Reserve Battalion of the Canadian Expeditionary Force (RG 150 Assession 92-93/166 Box 7636). 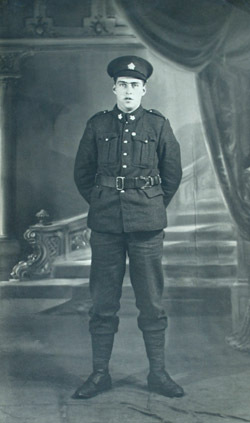 Carroll Patterson in postcard photograph taken in late 1918 - early 1919 in England. 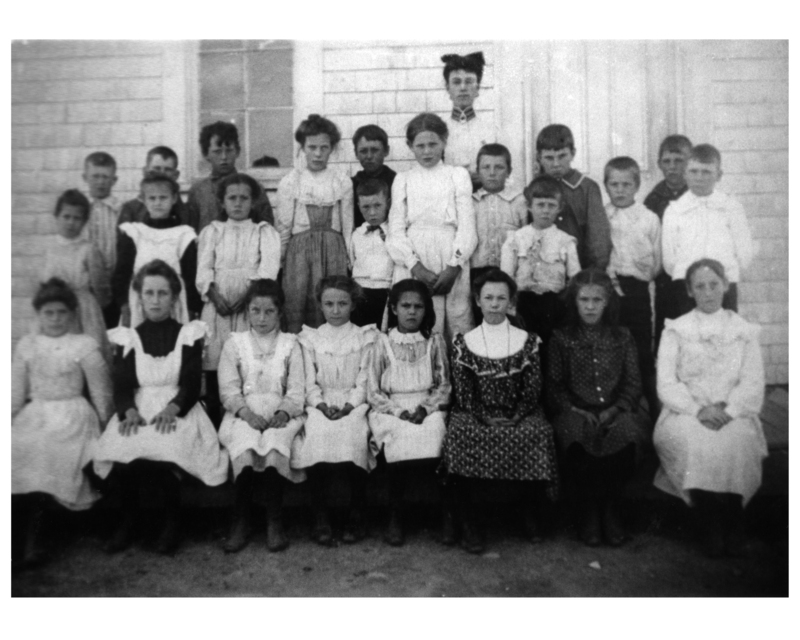 Source: original postcard image in possession of his daughter Irene Findlay, Riverview, N.B. 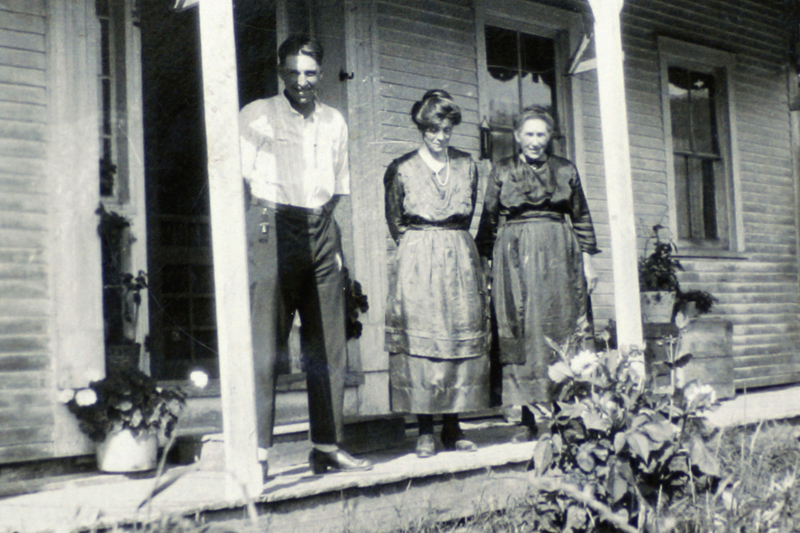 Carroll Patterson with wife Emma Moffitt and his mother Annie Brown in photo taken on the porch of his farm in Tweedside in the early 1920's before the birth of their first child Glenwood in September 1925. Reproduction here has been cropped about 50% to permit a better view of subjects. 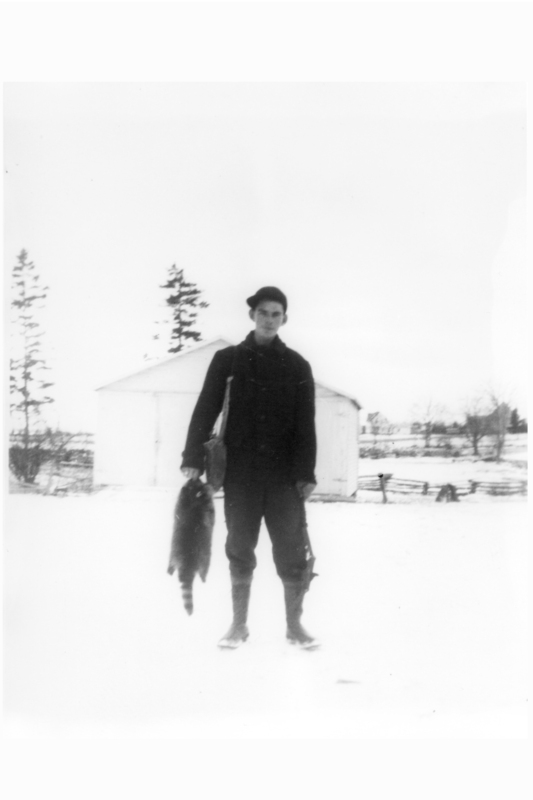 Source: original photograph in possession of his daughter Irene Findlay, Riverview, N.B. rephotographed by Tim Patterson, July, 2006. 8 Jul 1938 (Friday). Bridge at York Mills broke. All the traffic traveling this road. Gordon (Davis, her husband) to a frolic at Carl's (Patterson) farm putting in cement. 9 Jul 1938 (Saturday). Carl (Patterson) had a frolic finishing putting in the cement for the barn. 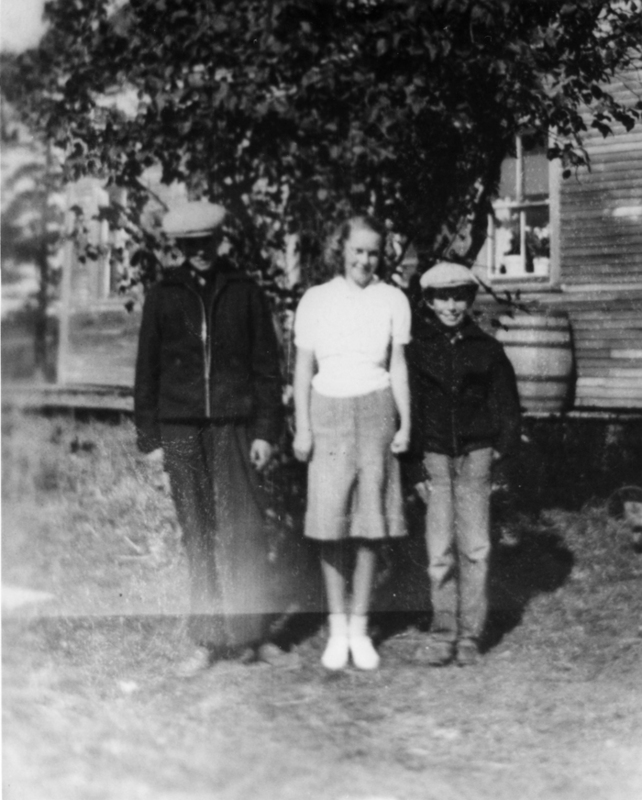 Gordon hauled logs from Gate's (Piercy) to (Jimmy) Murray's (mill). 16 Jul 1938 (Saturday). Carl (Patterson) had a frolic raising his barn. Gordon (Davis) raked the hay in the door yard. 17 Jul 1938 (Sunday). Roy (Messer) was here for dinner. Della & Gladys in Brownville over the weekend. 5 Nov 1938 (Saturday). Beautiful day. Very mild. Carl Patterson bought a new horse black one. Gordon and I were along to Gate's (Piercy) in the evening. 6 Nov 1938 (Sunday). Still mild and nice. Gordon and I were [ _ _] to Stewarts in the afternoon. Normon Smiths funeral. Carroll Patterson with wife Emma Moffitt and granddaughter Barbara in photo taken on the porch of his farm in Tweedside in the early 1920's before the birth of their first child Glenwood in September 1925. Reproduction here has been cropped about 50% to permit a better view of subjects. Harvey Station -- The death of Carrol M. Patterson occurred at Harvey Hospital. He was 88. Born in Tweedside, York County, he was the son of James and Annie (Brown) Patterson. He was a veteran of World War One, having served overseas with the Canadian Army. He was a member of Knox Presbyterian Church. 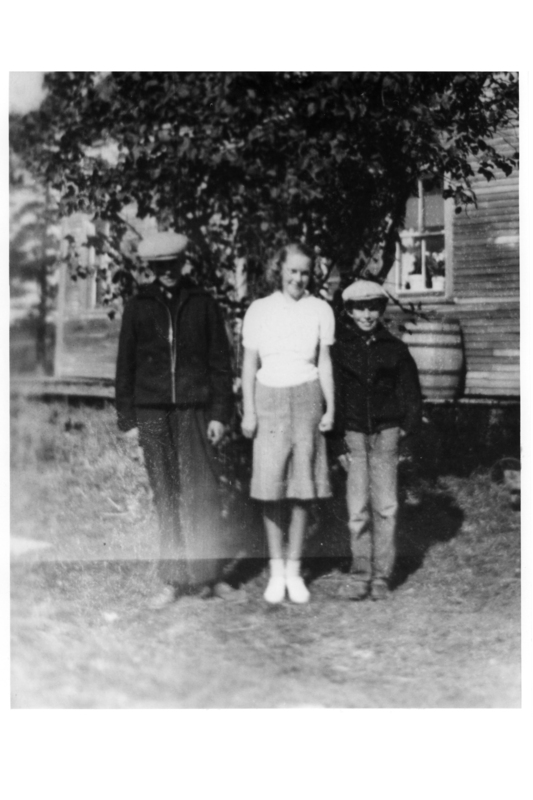 He is survived by two sons, Glenwood and Roy of Tweedside and Harvey; one daughter Irene Findlay of Riverview; one brother, Hazen of Tweedside; seven grandchildren and four great grandchildren. The body rested at Swan Funeral Home with funeral service from Knox Presbyterian Church, the Rev. Dave Dewar officiated. Pallbearers were Murray Moffitt, Floyd Moffitt, Willard Moffitt, Earle Patterson, Gordon Piercy and Winston Rutherford. 190x school phototraph of Tweedside School. 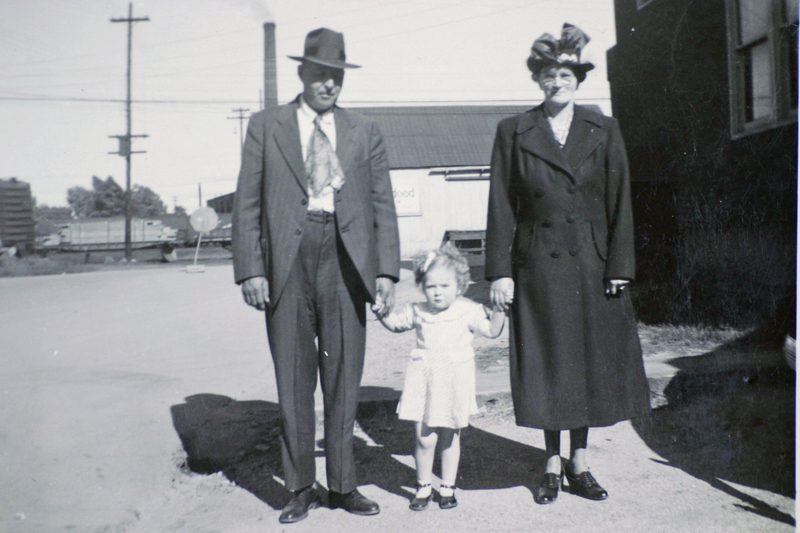 x year old Carrol Patterson is xxxxxx. The school teach (tall lady in back is: ). 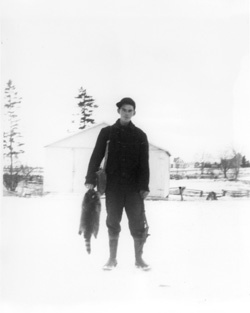 A Teenaged Roy Patterson with leghold trap and raccoon in front of "car shed" on family farm in Tweedside. Source: Irene Findlay, 1985. Rephotographed by Tim Pattersn, 1985. Reproduction rescanned and digitally enhanced by Tim Patterson, November 2006. Left to Right. 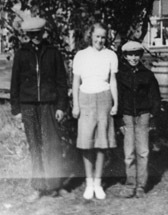 Undated image of Glenwood, Irene and Roy Patterson in front of family home in Tweedside.